You may substitute ground venison or antelope in this elk venison meat sauce recipe. 1. Mix the polenta, water and salt in a Pyrex bowl or pan. Cover with plastic wrap and microwave for 8 minutes. Remove and stir until blended. Cover and microwave for another 3 minutes. Remove from microwave and stir in butter and Parmesan cheese. 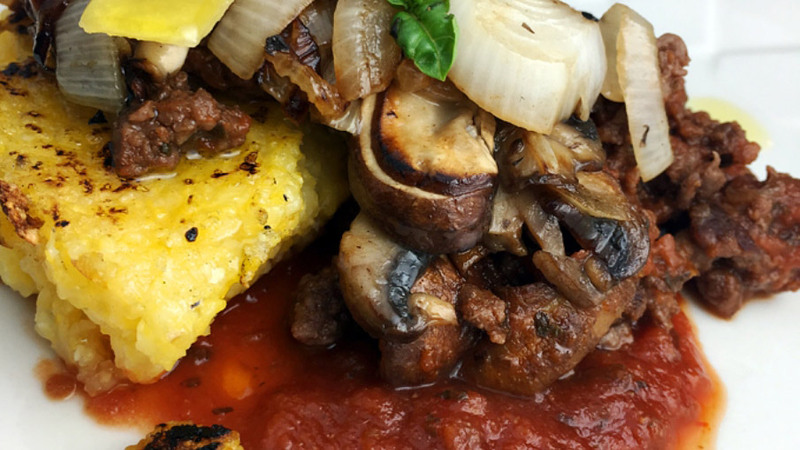 Set polenta aside. 2. To make the sauce, heat a skillet over medium heat and melt 2 tablespoons butter. Sauté onions, mushrooms and garlic until the onions are softened. Remove from heat. Add ground elk meat to skillet and cook until browned. While browning the meat, stir in oregano, salt and pepper. Push the meat to the side of the skillet and add the marinara sauce. When the sauce is warmed, mix together the elk meat, onions and mushroom mixture. Reduce heat to low. 3. Heat a cast iron griddle or skillet over medium heat and melt remaining butter. Add heaping spoonfuls of the polenta to the griddle and cook until browned and crispy on one side. Turn and continue to brown on the other side. Remove when done. 4. 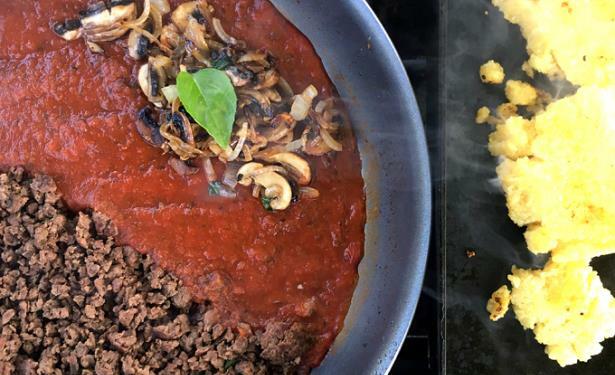 Serve polenta with elk meat sauce and garnish with shaved Parmesan cheese and fresh basil.